Last weekend was one of those "this never would have happened two years ago" moments. I made food for 30 people! True, it was only appetizers, but still! The event was a baby shower for my friend Kate and my co-hosts were her sister Krissie and our friend Jenny. Because you should stick with what you know when entertaining, three of the four recipes I made were from Rachael Ray. 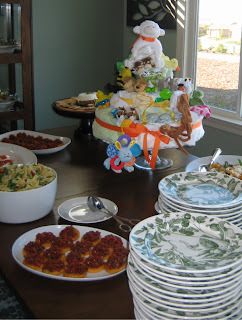 Krissie made the amazing diaper cake that served as the centerpiece for the table and Jenny made her famous salad with mixed spring greens, sugared walnuts, feta, mandarin oranges, and raspberry vinaigrette. I also made some Crostini with Ricotta and Roasted Red Bell Peppers from a cookbook I reviewed for Paper Palate. Cut asparagus into 1-inch pieces on an angle and add to a bowl. 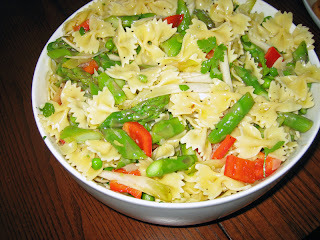 Combine chopped, cooked asparagus with shredded endive, red bell pepper, cooked pasta, green peas and chopped parsley. The peas will defrost as you toss salad. Pour vinegar into a small bowl and whisk in cooled shallot oil. Pour dressing over salad and toss. Season salad with salt and pepper, to your taste and toss again. Line a small shallow dish or bowl with plastic wrap or waxed paper. Coat wrap with vegetable spray. 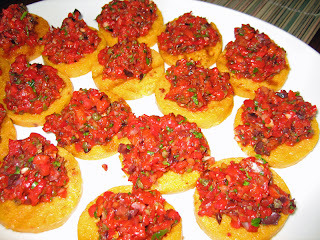 Arrange a pattern in bottom of the dish using the sun-dried tomatoes and basil. Add 1 1/2 tubs of garlic and herb cheese (about half a pound) [the amount you use will depend on the size and shape of the bowl you use] to the dish and smooth over, then layer in the sun-dried tomato spread and the pesto. 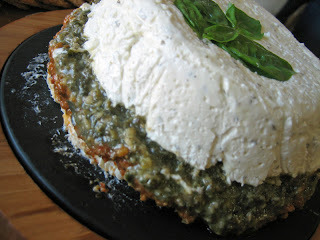 Spread the remaining cheese on top of the pesto. Place a serving plate over the bowl and invert the bowl. Hold on to the edges of the waxed paper or wrap to release the cheese. Remove the waxed paper or plastic wrap. Arrange the sliced baguette along 1 side of the torta. Arrange carrots and tomatoes along the opposite side of the torta. I was really nervous, but it turned out pretty well for my first try. Next time I would give myself more time to get it all done. Can I get the recipe for your friend's famous salad. I'm a sucker for those sweet/savory type salads. Pretty please?!? She says that's basically the recipe and that she just sorta throws it all in. She gets the dressing at Trader Joe's.